FILE - Laboratory technician Mohamed SK Sesay, who survived Ebola but saw many of his colleagues die and now has joint and muscle pains and loss of sight, holds the child of one of his work colleagues who died of the disease, in Kenema, Sierra Leone, Aug. 9, 2015. Patients who survive infection with the Ebola virus often continue to face numerous health problems. New research finds 80 percent of Ebola survivors suffer disabilities one year after being discharged from the hospital. Approximately 11,000 people died in the Ebola outbreak that hit West Africa from 2014 to 2016; tens of thousands more who were infected survived. Of those survivors, many battled vision problems and headaches that lasted for months. Researchers at the University of Liverpool and the Liverpool School of Tropical Medicine are studying what's called post-Ebola syndrome. One of the senior authors of the study, Dr. Janet Scott, says researchers are unsure why survivors experience such disabilities. "I'm not sure we've quite gotten to the bottom of it yet," Scott said. "The idea that you go through something as horrific as Ebola and just walk away from that unscathed was always a bit of a vain hope. So, it could be the inflammatory response. It could be damage to the muscles, and it could be the persistence of virus in some cases. It could be all of those things." 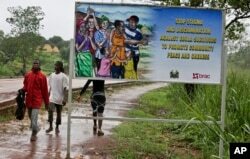 FILE - People walk past a billboard warning residents to stop the stigmatization of Ebola survivors, in Kenema, eastern Sierra Leone, Aug. 12, 2015. Scott says problems found in Ebola survivors' eyes may provide clues to what is happening elsewhere in the body. "They show some quite distinct scarring patterns," she said. "There's definitely scar tissue there. We can see it in the eyes. We can't see it in the rest of the body, but I'm sure it's in the rest of the body because the patients are coming in with this huge range of problems." The disabilities were reported in past Ebola outbreaks, as well. However, because past outbreaks were smaller and there were few survivors, researchers were not able to do major, long-term studies on the aftereffects. This time, said Scott, "There are 5,000 survivors or thereabouts in Sierra Leone, and more in Guinea and Liberia. So, it's an opportunity from a research point of view to find out the full spectrum of sequelae ... the things that happen after an acute illness." Military Hospital 34 in Freetown, Sierra Leone, also took part in the study, helping to recruit 27 Ebola survivors and 54 close contacts who were not infected. About 80 percent of survivors reported disabilities compared to 11 percent of close contacts. "The problems we're seeing in Ebola survivors, this is not due just to the tough life in Sierra Leone. This is more than likely down to their experience in Ebola," Scott said. The research was led by Dr. Soushieta Jagadesh, who said "a year following acute disease, survivors of West Africa Ebola Virus Disease continue to have a higher chance of disability in mobility, cognition and vision." "Issues such as anxiety and depression persist in survivors and must not be neglected," she added. Scott hopes the findings can be used to provide better care in the event of another Ebola outbreak, no matter where it is. In the West Africa outbreak, the first goal was to contain the epidemic, followed by reducing the death rate. "If I was treating an Ebola patient again, it has to be more than just surviving," Scott said. "You have to try to make people survive well. Surviving with half your body paralyzed or with your vision impaired and being unable to care for your family or earn a living isn't really enough. So, what I would like to do is to focus on that aspect to make people survive better and survive well."